To tell the truth, babies do not need much—love, a clean body, warmth and nourishing food. Still, we all like to give gifts to welcome new little souls. We like to see babies react to new experiences and we like to share things with new parents that our own children enjoyed. All through the first year, whether a new parent or the friend or relation of one, people enjoy bringing toys into a baby’s life. Here are a few thoughts on finding the best toys for different developmental stages in that important year. Toys can be seen primarily as a diversion, but they also can widen a baby’s experience of the world through new sounds, textures or actions. 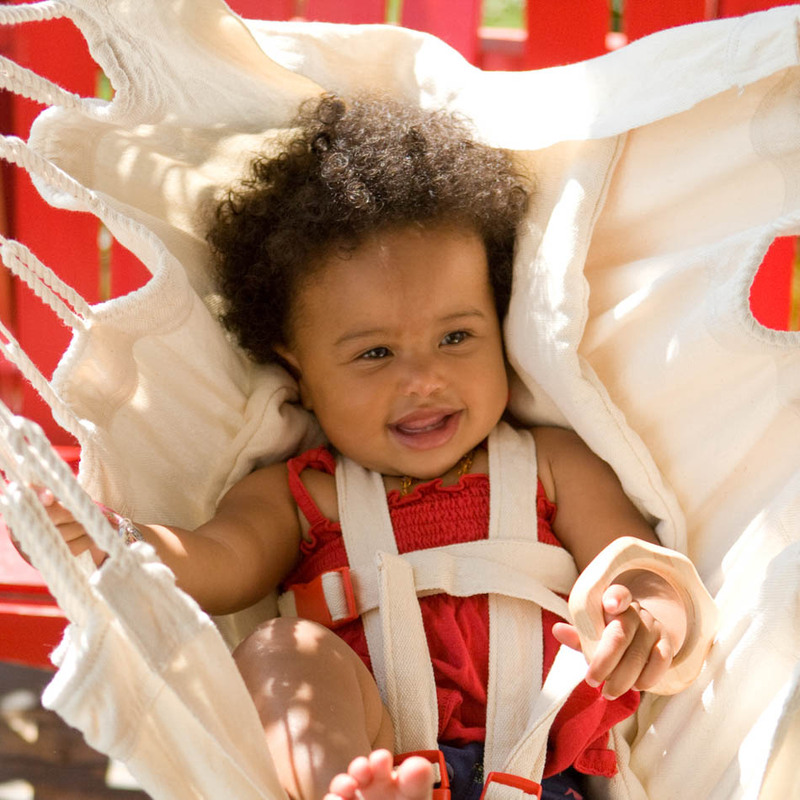 As a parent, you might be delighted by a mobile catching baby’s eye for the first time or by a rattle distracting your little one during a diaper change. Novelty draws your baby’s attention, and repeated exposure to a toy gives them a chance to learn about this world through a known object. 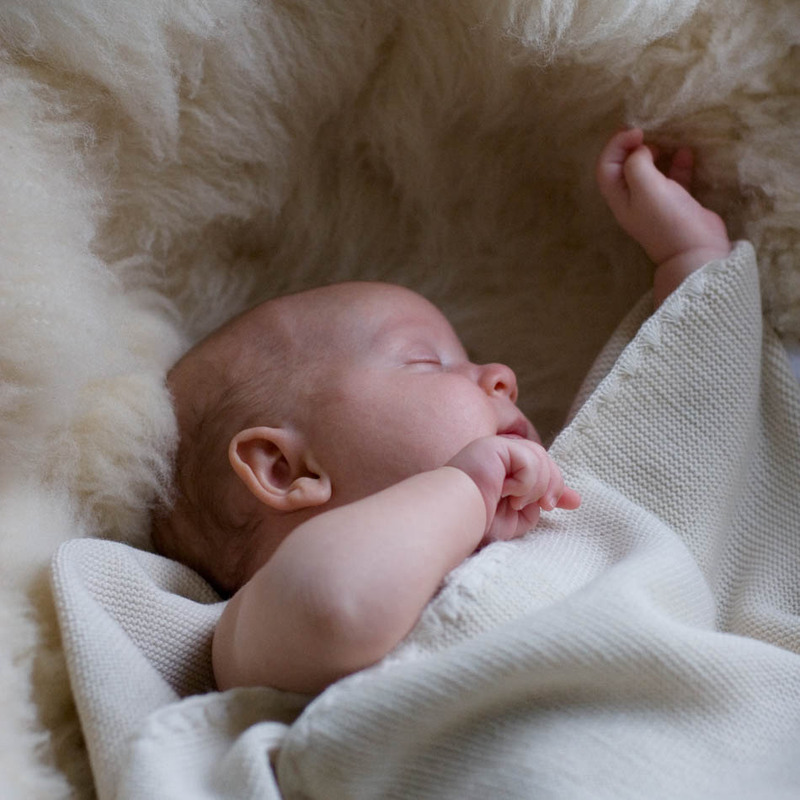 It is good to surround baby with natural fibers (wool, silk, cotton, wood) that warm with interaction rather than the cold artificiality of plastics. Also, when baby is mouthing a naturally finished wooden teether or organic cotton doll, you don’t have to worry as much about what you’re exposing them to. Newborns need holding and cuddling, lots of feeding and lots of attention. Their caregivers are the best diversion and entertainment, but there are times when even the most devoted mother or father needs to set down the baby for a few seconds. As babies begin to notice their world, they can be calmed or entranced by a gently swaying mobile. Grasping a play silk or unstuffed doll might divert them for a bit as they try out all the things their hands can do. In this very early stage, “with the world so new and all”, your baby does not need lots of jarring stimulation, but it can be a relief to have them quietly absorbed by these very simplest of toys. Between three and sixth months, your babies’ world will really begin to open up. They’ll be ready to thoroughly experience their world through any means available- which usually means their mouths. Play silks and knot dolls are perfect for this stage. 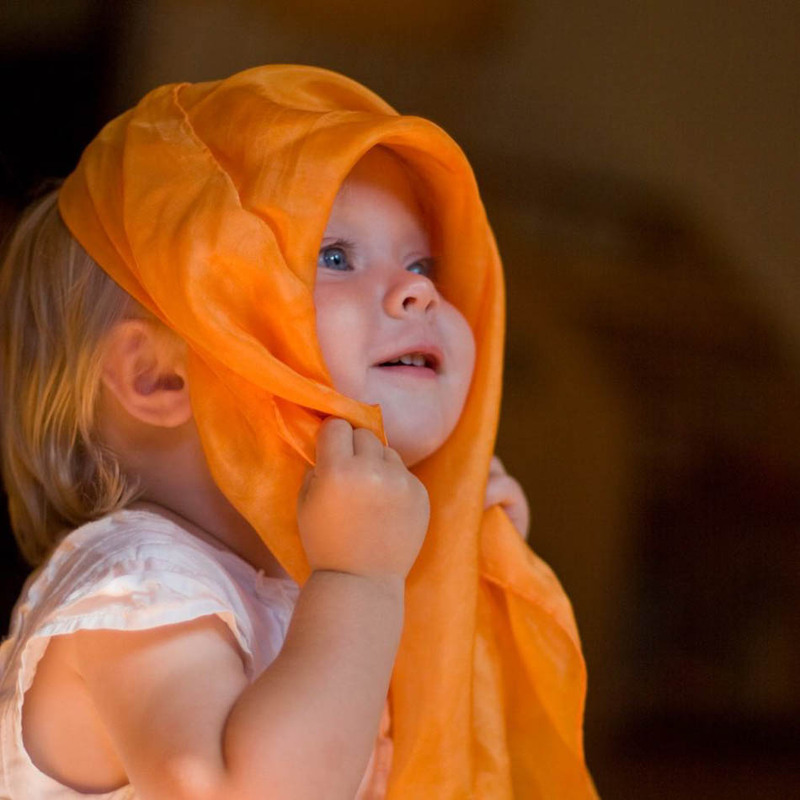 A baby will enjoy the texture of the silk as they bunch it in their hands or sample it with their gums. The knot doll’s hands are also good for working against gums and the unstuffed body makes it very easy to hold onto. The soft clatter of wooden rattles also begin to hold baby’s attention at this point. They go from turning toward the noise to trying to control it themselves; simple, lightweight wooden rattles are perfect for these explorations. Once baby is sitting up, a few well-selected toys can offer many minutes of happy, supervised play, while you steal a chance to clear the table without a babe in arms. You might even be seeing the beginnings of mobility. Soft balls and cars that roll away often interest this age group, as they delight in the action not only of the toy, but the caretaker returning it. They also enjoy making noise and might begin to like the clatter of blocks or the sound of a spoon hit against the floor. At this point, babies will be charmed by peek-a-boo and other games and toys with surprises. The last three months of the first year just continue to build on your baby’s expanding abilities and interests in the world. Now, baby might be able to chase down the toys that roll away. They also begin to enjoy toys they can push along or pull behind. While we think of pull toys as a delight for those who are already walking, crawlers often like toys that clack along behind them as they move through the house. These almost one-year-olds will probably also be ready to empty containers of toys. A tissue box of play silks makes a great toy at this age, because they can empty it over and over and it’s very easy to refill—ready to be emptied again. 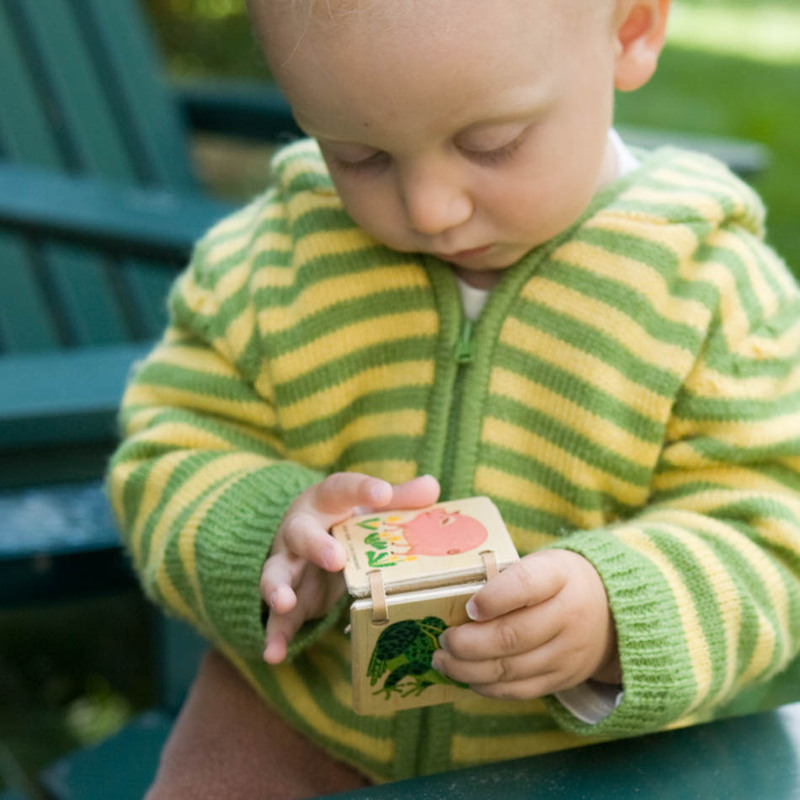 Older babies might also be ready to try their hands at stacking blocks or the simple puzzle of nesting boxes. They will probably begin to enjoy turning the pages of sturdy books, too; choose books with simple pictures that please the eye, as you might find yourself looking through the same favorite books for awhile. The first year of a baby’s life is an explosion of abilities and interests that require very little to foster growth, but when you do want to add something for fun or diversion, choose well, with your own child in mind.